The New York Mets have crushed left handed pitching. 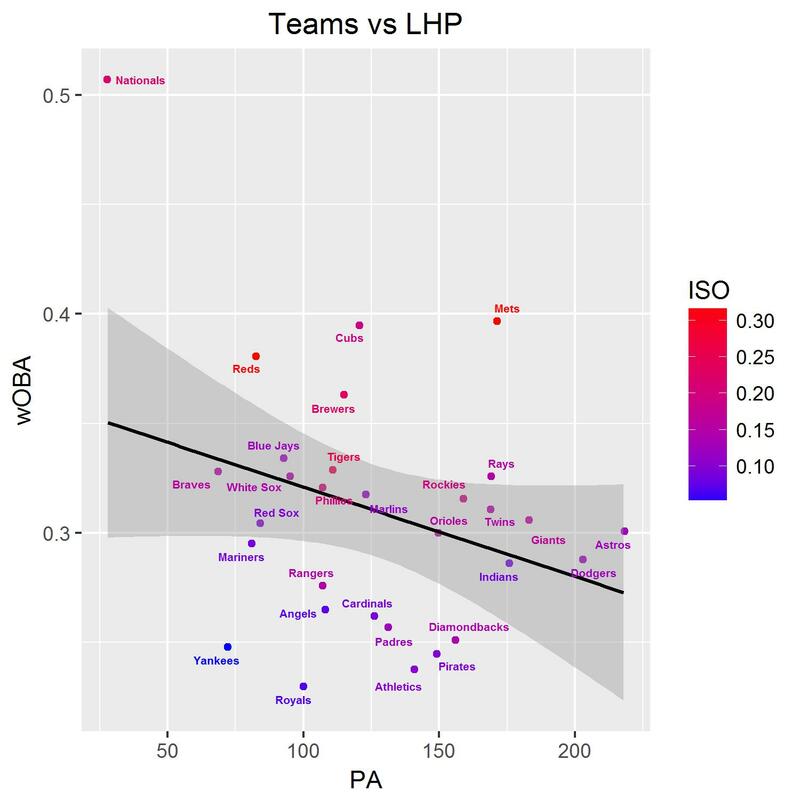 They have the 5th most ABs against LHP, own the 2nd best wOBA at .397 and have the 6th best K% at just 16.4%. Travis d'Arnaud is 6 for 9 with two doubles, a triple and two home runs when facing LHP. d'Arnaud and Jose Reyes have also drawn 3 walks. Neil Walker has hit 3 doubles and Yoenis Cespedes has 3 home runs off southpaws.. The Mets lead the MLB with 11 HRs against LHP and 31 runs scored. Houston Astros OF George Springer also has 3 HR off LHP. The Washington Nationals have somehow have managed just 28 plate appearances against lefties. 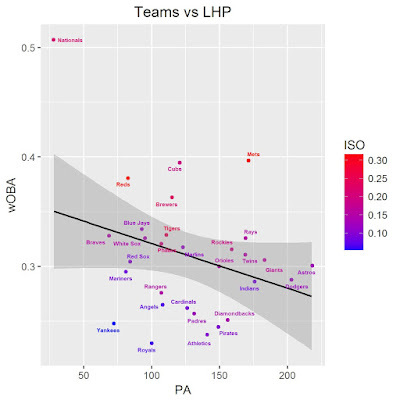 The Kansas City Royals have struggled against both RHP and LHP pitching, but they own the worst wOBA vs LHP in the MLB. They have scraped together just 3 runs against left handed pitchers. Los Angeles Dodgers 2B Logan Forsythe leads the MLB with 9 hits off LHP. He also have drawn 3 walks in 24 PA with 6 strikeouts. Nolan Arenado (2 2B, 2 HR) and Justin Turner (4 2B) each have 8 hits. Minnesota Twins OF Byron Buxton has 10 strikeouts in 15 PA vs LHP. He also has 13 K against RHP in 31 trips to the plate. Yasmany Tomas and Dustin Garneau are also struggling to hit lefties, with 9 strikeouts each.